Flower crowns or headpieces are just what they sound like: natural-looking crowns made from either real or fake flowers. Adding flower crowns to your wedding party can help to give the whole ceremony an ethereal, whimsical look like you might see in a fairy tale. Even better, while flower crowns can be bought from a variety of places, they’re also simple enough to be made at home with the things you might already have in a well-stocked craft room. Many flower crowns are made of fake flowers attached to a length of sturdy ribbon which is tied in the back when the crown is worn. The can be secured with either a hot glue gun or floral tape, depending on what you choose as a base. You can also build flower crowns off of cheap headbands or several layers of floral wire for added stability. Choose flowers that go well with your wedding’s color scheme. If you’re a more symbolic person, you may want to look into the meaning behind each flower you select and choose the ones with the most positive message. Real flowers will give you the most authentic look, but they’ll need to be constructed as close to the ceremony as possible, which may just end up giving you extra stress. 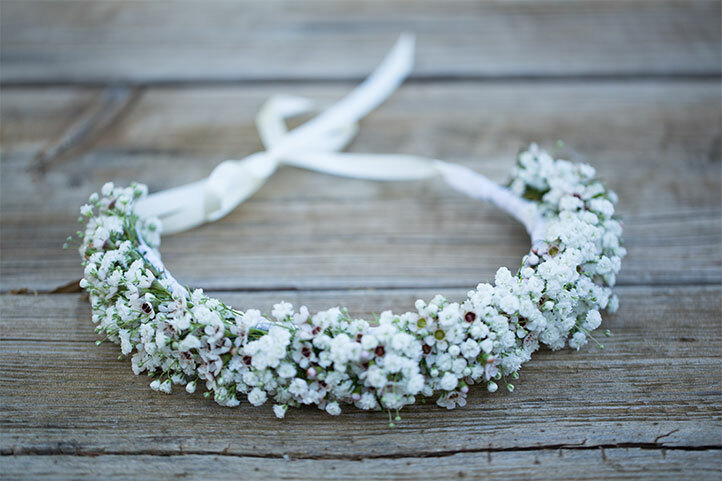 Artificial flowers on the other hand will not only allow you to make the crowns well in advance, but they’ll allow you to keep the crowns well after the wedding itself. You could even incorporate them into an anniversary celebration!